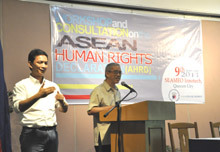 On 09 September 2011, the Philippine Working Group for an ASEAN Human Rights Mechanism (PWG) raised the momentum towards the development of an ASEAN Human Rights Declaration (AHRD) through its initiative of facilitating workshop and consultative meeting at the SEAMEO Innotech in Quezon City. The meeting convened human rights advocates across sectors who are determined to influence the ASEAN Intergovernmental Commission on Human Rights’ (AICHR) in crafting a regional human rights declaration that is reflective of the values and aspirations of the peoples in the ASEAN region. The consultation-workshop was an opportune time for the civil society groups to get the latest developments in the drafting process straight from Philippines’ representative to the AICHR, Ambassador Rosario Manalo. A substantive dialogue was facilitated as the ambassador responded to participants’ propositions on civil and political rights, socio-cultural rights, economic rights and duties and responsibilities. An in-depth discussion allowed the participants to identify the non-negotiable rights, crosscutting rights, regional peculiarities, and duties and responsibilities, which will be integrated in the declaration draft. The CHR representative reaffirmed the role of the civil society and non-governmental organizations in presenting their propositions in order to make the ASEAN Human Rights Declaration a better roadmap towards human rights development and cooperation. “Your various experiences as human rights advocates, activists and defenders in your special areas of work, will make the event today an enriching journey as you share your own stories of living human rights,” Atty. Legaspi shared. The Friedrich Naumann Foundation for Liberty supports the Philippine Working Group in its initiatives to strengthen the human rights system not only in the Philippines but also in the ASEAN region.